Life with Giggles: The hubby was pressured by Girl Scouts! Yep, he came home with not one, not two, not three..... but ELEVEN boxes! Yeah, you read right, 11. The picture above is just a sneak peek at some of the goodies. This is what happens when the hubby doesn't have me by his side when he is more than happy pressured to buy girl scout cookies. He has NO control. Or we can say that the Mom of the Girl Scout girl that works at his job was very convincing. No, forget that last sentence. They didn't need to be convincing since the hubby LOVES the cookies. Looks like we have dessert for the next 6 months! 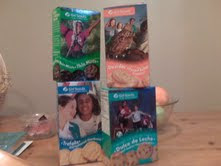 So, what's your favorite girl scout cookie? The hubby's favorite Samoas and Shortbread. Mine is the Shortbread and Thin Mints. This reminds me I ordered some [only 4!] boxes from a couple girls & haven't got them.. I love the Carmel Delights! mmm!